Law Web: Whether filing of chargesheet can be treated as change of circumstances entitling accused to be released on bail? Whether filing of chargesheet can be treated as change of circumstances entitling accused to be released on bail? guilty by the competent court. Principal Sessions Judge at Raichur, which stood dismissed. of specific overt acts, and rejected the application. and accordingly the inevitable result, the dismissal, followed. appellants to move the High Court in Criminal Petition No. the prayer for grant of bail. which was dismissed vide order dated 27th November, 2015.
community and the accused belongs to “Lingayat” community. accused No.1 in the year 2014 and at that juncture, an F.I.R. one has entered appearance on behalf of the informant. hence, it deserved to be set aside. 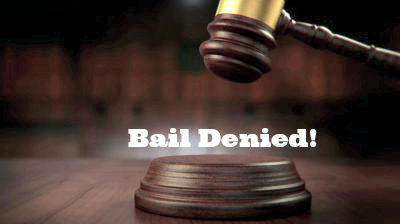 person at his trial by reasonable amount of bail. in the most extraordinary circumstances. score and understanding of the pronouncements in the field. accused had committed the offence. Court and curtail the liberty of the 2nd respondent. vulnerability warrants annulment of the order. that impropriety call for axing of the order. passed by the learned trial Judge. evidence to be adduced during the trial.